Kids are "Cooking up Good Nutrition" by practicing in the meal preparation process...everything from shopping in the grocery store, to meal planning and preparation in the kitchen. Get involved and learn about good nutrition and healthy eating. Learn about the benefits of eating more fruits and vegetables. Learn how to avoid foods with empty calories, foods with no nutrition value. Getting involved in the kitchen is fun! 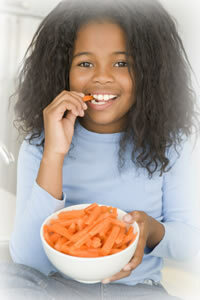 There are plenty of fun ways to liven up snack time using healthy fruits, vegetables and cheeses. You will love creating and eating fun-to-make snacks with your kids in the kitchen! Registered Dietician and SuperKids Nutrition Founder and Creator of the Super Crew ®, Melissa Halas-Liang guides a team of young chefs through the fun filled process of making nutrition snacks using fresh vegetables and low-fat Cabot Cheeses. Eat more veggies! Registered Dietician and SuperKids Nutrition Founder and Creator of the Super Crew ®, Melissa Halas-Liang, shows us how to make a multitude of flavorful and healthy snacks with popcorn. Make at least half of the grains you eat...whole grains!